Challenge: An air purifier manufacturer needed to remind customers to periodically change filters to maintain product efficiency and deliver consistent customer experience. 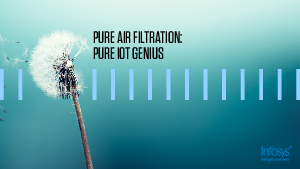 Solution: We helped them develop a Bluetooth enabled ‘smart’ air filter, where an embedded sensor measured the effectiveness of the filter and relayed that information to an iOS or Android app. Users were alerted when filters needed replacing, and given the opportunity to buy directly through online retailers and also to subscribe to the Amazon Device Replenishment Service.